Nice bone china saucer made by Victoria C&E (Cartwright and Edwards) in England. Scalloped edges with gold edge trim. 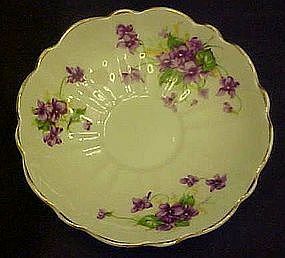 pretty violets adorn the saucer. Measures 5 1/4" in diameter. Do you have the matching cup?